Where Is The Voice of The Slacktivists? If every movement begins with being moved, should it matter how the movement is started? Are slacktivist actions less important? Is it “American” to want low-risk, low-cost, technologically mediated participation/activism? If it’s not “American” what is it? What are the positive and negative outcomes of such participate (slacktivism)? Initially, it may seem that it is “American” to want low-risk, low-cost, technologically mediated participation/activism, however, after a closer look, it is not “American”. During the Arab Spring there were countless protests facilitated through the use of social media. 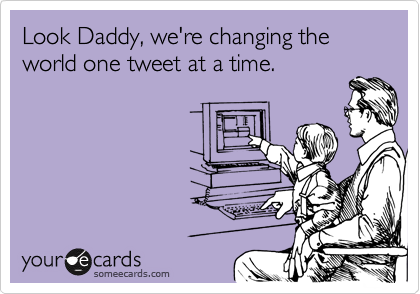 KOBY 2012 spread to the entire world trough the avenue of Twitter. Slacktivism is not “American”, it’s “smart”. It’s smart because it adapts and changes. Societies are not stagnant. They change and they grow. Thus, technologies, must also grow and change with society. Shirky explains that “we now have communication tools that are flexible enough to match our social capabilities, and we are witnessing the rise of new ways of coordinating action that take advantage of that change” (Shirky, 20). Furthermore, he explains, “Our social tools are not an improvement to modern society, they are a challenge to it. A culture with printing presses is a different kind of culture from one that doesn’t have them. New technology makes things possible: put another way, when new technology appears, previously impossible things start occurring. If enough of those impossible things are important and happen in a bundle, quickly, the change becomes a revolution” (Shirky, 107). What Shirky has just described is the Arab Spring without even knowing it. Here, Shirky could also be describing a new kind of activism, a revolution towards slacktivism. This revolution is not American; it is smart; it is human. Humans have always taken advantaged of the technologies of the time. Right now we are in the midst of a shift in activism. Shirky also places great importance on group action to understand the changing of social media. He explains, “[b]ecause the minimum costs of being an organization in the first place are relatively high, certain activities may have some value but not enough to make them worth pursuing in any organized way. New social tools are altering this equation by lowering the costs of coordinating group action” (Shirky, 47). The cost of coordinating group action could not be lower than they are with slacktivism. Slacktivism still entails responsibilty to the cause as did traditional activism: “Information sharing produces shared awareness among the participants, and collaborative production relies on shared creation, but collective action creates shared responsibility, by tying the user’s identity to the identity of the group” (Shirky, 161). Slacktivism is necessary as our tools are changing. We must learn how to adapt rather than fight against it. The more I look into the world of slacktivism, the more I long for the voice of the slacktivist. This voices seems to be missing entirely from the discussion, perhaps more appropriately, the criticism of slackvists. Why are the slacktivists content will the bad rep they have been receiving over the past year? I think the answer is simple. Slacktivists are not the people the public believes them to be at all. Slacktivist would be activists in the traditional sense, but traditional activism is not working in today’s world (cue video of failed OWS attempt). So what do slacktivists do? Adjust, they act as octopuses, adapting the their environments and blending in while making change. The idea sounds pretty intelligent to be. While the tactics are not as direct and physical as traditional activism, they are successful. One of Change.org’s petitions enacts more change than OWS over an entire fall and early winter of protests. Change.org petitioners acted in favor of the 99% when they succeed in forcing Bank of American to repeal its suggestion of a $5 fee to use ATM cards. The point of OWS is to protest against institutions that allow those who are ahead to stay ahead and push those behind further and further behind. 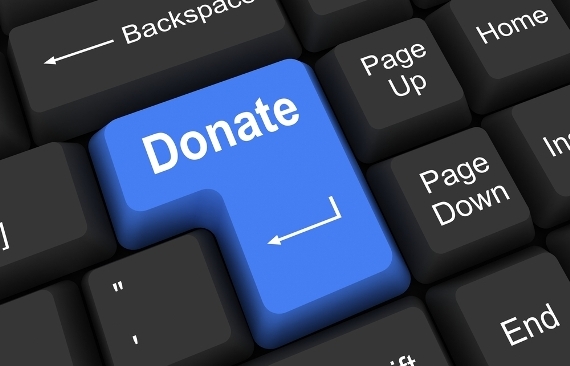 Change.org was able to combat a similar idea through a petition. There was no take-to-the-streets protests, instead there was success. I think we need to hear the voices of the slacktivists. The slacktivists are the ones who understand the world in which we are living. It is not the same place it was even 10 years ago. Traditional activism does not mess with this new digital world. We must learn how to adapt. Or we will certainly be left behind. I think we need to commend slacktivists for doing what the majority cannot: accept change. tvo’s Jesse Brown answers the question: Who’s lazier- online activists, or those who dismiss them? “We are now in a battle for the soul of Occupy… a fight to the finish between the impotent old left and the new vibrant, horizontal left who launched Occupy Wall Street from the bottom-up and who dreams of real democracy and another world. Whatever you do, don’t allow our revolutionary struggle to fizzle out into another lefty whine and clicktivist campaign like has happened so many times in the past. Let’s Occupy the clicktivists and crash the MoveOn party. 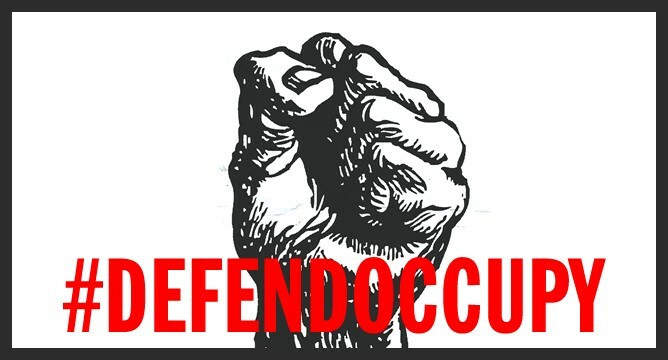 Let’s #DEFENDOCCUPY and stop the derailment of our movement that looms ahead” (Battle for the Soul of Occupy). MoveOn’s 99% encourages a spring training where: “In the span of just one week, from April 9-15, 100,000 people will be trained to tell the story of what happened to our economy, learn the history of non-violent direct action, and use that knowledge to take action on our own campaigns to win change. We’ll gather for trainings in homes, community centers, places of worship, campuses, and public spaces nationwide to learn how to join together in the work of reclaiming our country through sustained non-violent action. 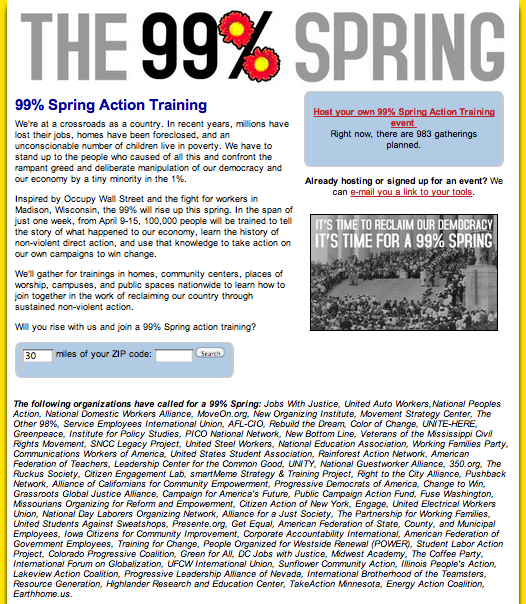 Will you rise with us and join a 99% Spring action training?” (MoveOn’s 99% Spring Training). MoveOn.org seems to be looking for an alternative to the OWS protest we saw last fall. It seems like MoveOn.org is not hopeful in the prospect of another OWS protest, instead, the sites suggests we turn to a more slacktivist approach of “nonviolent direct action”. MoveOn wants changes, but it doesn’t believe that OWS is capable of making the changes, if it did they would just jump on board. If will be interesting to see what happens to the OWS campaign over the next few months as activism and slacktivism go head to head! Tastemakers is usually an individual or a small group of people, it usually helps when they are famous, who find a video, post it, tweet about it, share it and so on so that many other people will see it. Once the contacts of the tastemakers see the video, if it was a good (in whatever sense) as the tastemaker suggested, the contacts will most likely share the video as well. The process continues until we have videos like Rebecca Black’s going viral. The next step makes a lot of sense. Here, participation does not only mean participating through watching the video, it means engaging in the video you are watching. You may ask how does one do this? This answer: parodies and memes. There were parodies for every other day of the week after Friday went viral. After KONY went viral, people were going crazy with the memes (see below). Participation means taking a step beyond that of merely watching a video. It means extra time and extra effort. It means you cared enough (for whatever reason) to decidate more time to what you had just watched. For the most part, there is no rhyme or reason for when YouTube videos go viral. Well, maybe when Tosh.O finds them… But anyway “normal” videos like Rebecca Black’s that go viral are unexpected. What about activist videos like KONY. Well those are planned by the creators, but when the video will erupt is unknown to the average person. This idea of unexpectedness is at the heart of AI’s SMAC Digital Protest, to surprise to media with the vast spread of activism on one particular day is crucial to these protests success. Who knew how telling Rebecca Black’s song Friday could be to the understanding of how slacktivism worked! From Kony 2012 to Trayvon Martin: Is There A Difference? “Slacktivists are the hipsters of the digital world: everybody recognises them but no one claims to be one” (Kendzior). Kendzior explains that the term slacktivism “likely predates the internet campaigns with which it is now associated – whereas once bumper stickers and buttons sufficed to show conviction, there are now groups to join, videos to share, causes to like, and other static virtual entities whose worth is calculated in clicks.” Slacktivists are highly criticized, but what about the causes they support? KONY 2012 has raised so many questions about whether this new form of social media activism, slacktivism, can be sustained. KONY 2012 did nothing to help the cause of the slacktivists we see on Change.org. KONY 2012 was the stereotype of the ethos of slacktivists: “viewers oblivious to a complex foreign conflict are made heroic by watching a video, buying a bracelet, hanging a poster” (Kendzior). This is the epitome of “feel good” activism. However, this does not represent the real slacktivist, in its true form. While KONY 2012 did display networked symbolic action it is not the same networked symbolic action that is seen on Change.org. Like anything, there are different sides of slacktivism: Change.org and KONY 2012 represent two sides of the same coin. After their son was shot and killed, Tracy Martin and Sybrina Fulton started a petition on Change.org calling for the arrest of George Zimmerman, the man who shot and killed their teenage son, Trayvon. Not even a month later, the petition had accrued over 2 million signatures which is the largest in Change.org’s history. What does this mean? Well, March 2012 has seen the most viral video (KONY 2012) and most viral petition (Justice for the family of Trayvon Martin) EVER. While the KONY video marks injustices that are happening half the world away, the Trayvon Martin hit much closer to home for American slacktivists: racial inequality. Kendzior explains that, “much as Kony2012 inspired impressive writing on African conflict, advocacy, and intervention, the Martin case has prompted serious reflection on race in America. The difference is that, in the case of Kony2012, “slacktivism” itself was the problem. The deluge of articles came as a corrective to a simplistic tale made meaningful by so many people believing it. In the case of Trayvon Martin, the cause prompted the conversation – because it is not only a cause but a symptom; a symptom of systematic injustice that Americans are confronting through, and in part because of, social media.” Let me reiterate, the case of Trayvon Martin prompted conversation. Activism is intended to promote conversation to encourage change. That is what Martin’s petition on Change.org was doing. The spread of KONY did not spawn the same sort of reflection. Still, but both acts of slacktivism serve as a reminder that it is hard to dismiss or define slacktivism. What motivates individuals in hard to define. Motivations are subjective: feelings of sympathy and empathy, awareness and understanding, curiosity and coercion, that the quantitative analysis of clicks cannot discern (Kendzior). This site truly mixes the digital world and the notion of activism and take-to-the-streets protests. Virtual protests, as the ones featured on the SMAC take just as much effort as real protest in terms of planning. Some may argue that the actual protests lose the value and uniqueness of take-to-the-streets protests, however, this is just not true. We have to reframe our ideas of what protests should be; we are no longer living in the 1960s. The world is changing and in this new world where everyone is consumed by social media and in digital spaces the most successful protests and acts of activism infiltrate these spaces, they make the issues unavoidable. The slacktivists that participate in these protests are smart, they are changing with the times.